A lot of people have asked what my daily schedule looks like, so here’s a little peek at how things run in my class. I’m starting by explaining how I do Daily 5 since that program gives my day its main structure. A few years ago I was teeth-gnashing, nail-biting frustrated by the lack of time I had to actually teach. The number of weeks where I had 5 uninterrupted, routine teaching days could be counted on 1 hand. Since most of those weeks fell during the first month of school when all the procedures are still being learned, so they’re not really routine anyway. So that comes out to about 2 “routine” weeks during the year. During all the other weeks there was an assembly, a holiday, professional development training, PTA event, district assessment, visiting curriculum coaches, parent conference, field trip, guest speaker, etc. No single distractor is making too many demands so they ALL feel that I should have no problem sacrificing 15…30…90…minutes to whatever they feel is a better use of my (and my students’) time. Every time I think about this onslaught of time suckers, my blood starts to boil a bit. I can’t do anything about Thanksgiving and the visiting firefighter was very interesting, but where is the time to get my students solid with parts of speech? When am I supposed to teach measurement? A couple changes to my scheduling helped me make the most of the time I do have. First, I started planning units based on a 3-day week. The last day of the week (typically Friday) has a routine all its own, so that left Monday-Thursday. You know SOMETHING will come up on one of those 4 days, so if I plan around 3 days I’m not having to decide what to cut out or cramming activities together. The second help was starting Daily 5. Also, this gives me the perfect chunk of time to axe if something has to go. Here’s how Daily 5 goes in my class. For some reason I don’t have pictures (why don’t I have pictures???!!? ), so you’ll have to make do with my illustrations. At the front of my room, on the wall under my whiteboard, I’ve hung 4 small pocket charts. I got them from the Target Dollar Spot (I just saw them in stock now, so jump on them!). I use these pocket charts for tracking Daily 5. I took the idea from Mrs. Bainbridge’s Class Website. I cut strips of cardstock to fit the length of each pocket. Each strip is labeled with a name and 5 boxes. When students arrive in the morning, one of their first tasks is to choose the order of their stations for the day. Too many kids are doing that station at that time. If more than 8 kids or so has chosen a station at a time, I ask some kids to switch. The student goes to a pull-out class during that time (resource, speech, Title I, ELL, counselor). I need to meet with the child at that time. Students who have proven they can’t handle working together are trying to work together. A student needs practice in an area (say with word work), but is consistently choosing that as a last choice in the hope we won’t get to it during that day. Then I will specify that station needs to be first. Here you can see that “Sadie” has made her choices for the day. Evan and Jose haven’t arrived yet, but some of their choices have been assigned by me. Sadie won’t be meeting with me today. Each of the 5 stations has a different area in the room. The kids can stay in that spot to work or take the work to their desks. Here is a description of our different stations. 1. Work on Writing: This is straight out of the Daily 5 book. I think I’ve explained it well in previous posts. Before students get to work, they must complete a Jargon Journal word card. It only takes a minute or two. Then they are free to choose any activities from the writing station. If they finish or tire of that activity they may choose another. If I notice a child is just hopping from activity to activity without making an effort to work, I impose some boundaries. I may get to choose that child’s work or may set a time limit for switching. 2. Word Work: There are 2 “must–dos” at this station. Second, they must practice their 4 sight words using one of the games at this station. I’ve found that Dollar Tree is an excellent resource for these games. Any turn-taking game is perfect for this center. 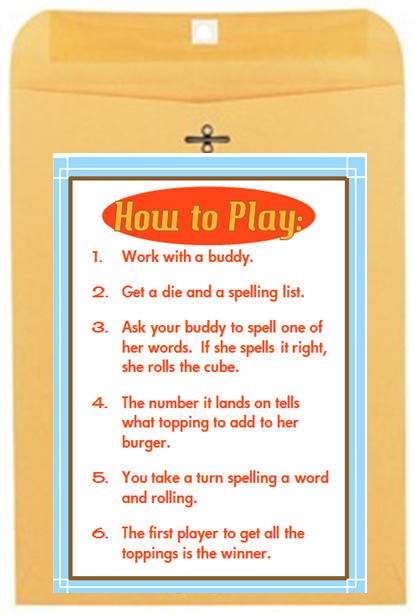 Before the child can take his/her turn, the partner asks the child to spell one of the sight words. 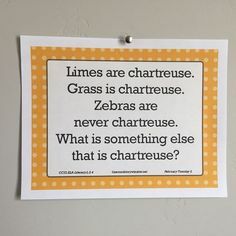 If spelled correctly, the child takes a turn and partners switch roles. This tic-tac-toe game was 4 for a $1. After that they are free to choose any of the other word work games available. The Word Play phonics games from previous weeks are available for play here. And I also have other purchased games, mostly from Lakeshore. 3. Read to Someone: On Thursdays pairs of students must first read that week’s Scholastic News, otherwise they are free to choose their reading material. They can choose to share books or take turns reading from their own book. I also have available for buddy reading a set of I Read to You, You Read to Me books by Mary Ann Hoberman. From back in the days when I did centers, I have an assortment of plays. They’re mainly from Scholastic Teaching Books like this and this. I provide some very simple props and the kids think they’re great. But the number one favorite choice for buddy reading is the joke books. Because my goal with Read to Someone is for students to improve their oral reading fluency, I love to give them joke books. They will read these over and over. I am a dyed-in-the-wool introvert. There were times in school when I really resented having to work with a partner. Because of my past experiences, and because I don’t believe there is anything wrong with wanting to be alone sometimes, I provide stuffed animals for “buddy” reading. These are all cheap, little ones from Oriental Trading. My goal is reading fluency, so if the child is reading aloud to a stuffed animal, that is fine with me. Students may also use toy microphones, if they choose. I understand that sometimes students may wish to read with a partner, but lack the social skills to pair up. When I see a student choose a stuffed animal, I try to check with the child to see if he/she would prefer to partner with another student who is at the same station. If so, I help the child think of something to say to a potential partner, for example, “Would you like to read with me?” The rule in our class you are welcome to read to a stuffed animal or you must say yes to the first person to request you. You can’t tell someone no and then choose another student. While students may change reading material at this station, they may not change partners or stuffed animals. 4. Math Games: This choice isn’t from the Daily 5 book. I have a bazillion math games that I have either made or purchased over the years. I put one game each in a bunch of Sterilite drawers. Over the course of a week I assign two kids to be an “expert” for each game. The “experts'” names are post-its on the outside of the drawer. If a student doesn’t know how to play the game, he/she can go find one of the experts. If we play a game during math class, that is then added to this station. I don’t assign an expert because the whole class has already learned the rules. 5. Number Practice: This is another station that’s not in the book. Here the kids are mastering the different combinations for a certain number. For example 6: 3+3, 2+4, 5+1, and 6+0. Students are assigned their number based on personal goals. I will explain this station in much greater depth in a later blog post. You may have noticed that I’m missing 2 of the “standard” Daily 5 choices: Listen to Reading and Read to Self. The way things run in my class, I felt that Listen to Reading was redundant. I’m reading aloud at least twice–usually three, four, or five–times a day. I felt my students would be better served by offering math practice as a choice. When it comes to Read to Self, my rationale for not including it as a choice is simply a matter of time. All my Daily 5 stations times run in the 15-20 minute range. That is just too short a time for independent reading. Also, while the class is focused during our station time, there is a bit of an energetic buzz going on. I felt that it was too distracting to expect some of my kids to be able to focus on books. Therefore, we have a 35-45 minute reading time in the afternoon when EVERYONE reads and I work with reading groups. Of course it takes a long time to get the kids trained to this system. My very favorite thing about the Daily 5 program is the structure it establishes for maintaining high behavior expectations. I introduce 1 station at a time and we chart our on-task work time. There are LOADS of similar graphs out there, but I used these ones from F is for First. Once we reach about 8 minutes on-task work time in a station, I introduce another. I begin with the writing station. Then math games, number practice, and word work. I stick Read to Someone very last because it has the most potential for kids causing problems. This way my expectations are very clear by the time we get to that point. The first year I did Daily 5, my students needed a record sheet for accountability. I used it at the beginning the 2nd year of Daily 5, but I found it wasn’t necessary and discontinued it. It’s meant to be copied double-sided and lasts a week. I collect them at the end of the day and have a fast-finisher distribute them in the morning when she/he is done with the morning work page. We end Daily 5 stations about 5 minutes early on Thursday afternoon to allow for the reflection and goal setting part of the page. I collect these, then, and go over them. I may use these during parent-teacher conferences or to help perpetual wanderers focus, but I don’t record or grade them. Doing Daily 5 has opened up large chunks of time in my day. With my lowest kids I may meet with them twice during the day (once during Daily 5 stations and again during reading time). Although if they also go to a pull-out program that day (speech, ELL, reading, resource, school counselor), I try to only take them away from their choices once. Scheduling can get a bit hairy when the poor kid is already getting pulled out for 2 programs and I still want to meet with all the kids that still need help telling time. I have 1 iPad in my classroom and I make good use of it during Daily 5 stations. If I have a group of kids with me back at the table reviewing their word sort, I can have another kids sitting next to me with the iPad doing a time telling app or sight words or loads of other skill-specific apps. Daily 5 takes a bit of juggling to get up and going, but it is SOOOOOOO worth it! It feels like such a gift to have a program that frees me up to be the teacher my students need me to be. Head over here to read Part 2 of this post to see where all this station time fits in my day. Thank you for this! 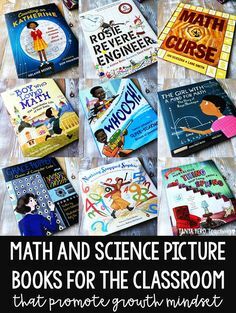 I am a homeschooling mama that wants to change up the boring old workbook day into fun and quick learning periods. I’ll be checking back for more insight so that I can make learning fun and memorable for them. I am moving to 2nd this year and really struggling with ‘seeing’ Daily 5. I couldn’t wrap my head around it. Seeing your schedule really helped. Very helpful to see your day laid out so clearly. Thanks! Thanks for sharing! It is so nice when we can all share and not have to sell our trade! 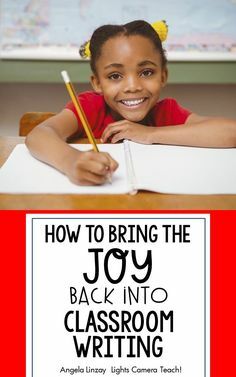 This was a very helpful post! I loved seeing how your students make their choices and how you structure your Daily 5 time. Thank you so much! I don’t see how you have time to do all that you do( teaching, blogging, creating, etc. )In your writing center do the kids use their own individual journal or do you have a few journals that everyone writes into? I don’t have time–that’s why I’m teaching preschool now and my house is a disaster! The kids have their own journals and there are a few class ones on general topics like, birthdays, vacations, holidays, sports, 1st grade memories, stuff like that. WOW!! I don’t see yet how I could make it all work but I’m willing to give it a try! Thanks for this very informative and encouraging post. Thank you so much for sharing your schedule! I’ve been doing Daily 5 for a couple years but love to see how others have tweaked it. I couldn’t get the recording sheet page 2 to load for some reason by the way. I tried reuploading it. See if it works now. Good luck with your Daily 5-ing! Thank you for explaining the Daily 5 so well – I have not thought of adding Maths into the Daily 5 and due to having purchased a reading programme and having 5 computers in class, I have added this as another element. I don’t know how I missed this earlier but this is an amazing post. Thanks for the freebies! I agree Cori. It is nice to see free sharing 🙂 We are, after all, all there for the same reason – to help kids learn. If something works – then tell the world!! Thank you Heidi and Emily! I hate to bother you but where did you get the cardboard book bins? I can find any. They’re banker boxes. I’m not sure where to buy them. The school just had a bunch. Thank you so much! I have felt like a “Daily 5 flunky”! I have tried so many ways to get every thing in!! Your ideas for right into my ideas, but are much better organized!! I will be downloading everything for the coming year!!!! Thanks so much!! What do you do for the “class” rotation? That’s for pull out classes: special ed., speech, ESL, reading tutoring, psych groups, etc. You mentioned the students work on their 4 sight words. 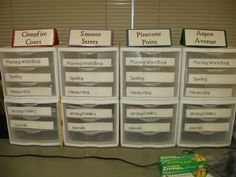 Do you have a differentiated sight word program for your students? How do you manage the sight words – assessment, words, etc’ thanks so much for sharing your terrific ideas! I do have differentiate sight word program. I typed up lists of 80 sight words and tested the kids. They got lists of the ones they missed and chose 4 of those each week to practice spelling. My goal is to write a blog post about it in the next few months to give more information. I love that you let your kids pick their own centers. I also let my kids pick their own and pull them to see me as needed. I see so many teachers plan every minute for every kid, but hadn’t come across anyone who worked rotations anything like me. Yay! I also first started with a “tracker” sheet but have since stopped using it.